Vice President of Campus Safety and Event Management Mike Seamon addressed faculty and staff at the recognition luncheon. At the last Town Hall meetings in the fall, Executive Vice President John Affleck-Graves highlighted the University’s effort to reduce injuries across campus. Over the last year, Notre Dame has made significant strides to improve the safety of campus for faculty, staff, students, and visitors. In fact, ensuring the safety of campus will always be the University’s top priority. 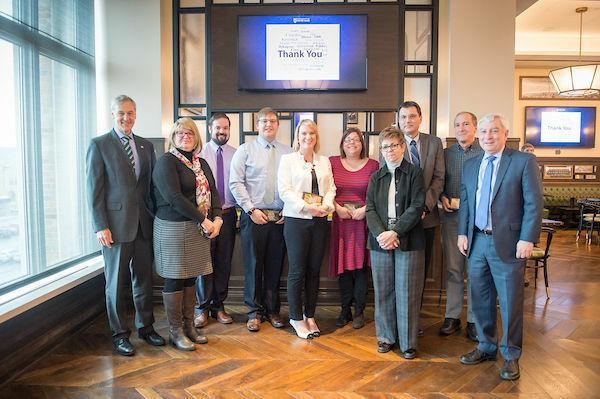 On January 29, the Department of Risk Management and Safety held the Annual Safety Recognition luncheon to celebrate the improvements campus has made because of the leadership of many faculty and staff. Chip Farrell, senior environmental and safety specialist, received attention for his work in establishing a rooftop fall protection plan. Farrell says that he and Randy Crist, safety specialist in Risk Management and Safety, performed an assessment of all campus rooftops and are in the process of implementing physical safety improvements as well as procedures to ensure that personnel are protected from fall hazards while performing work on campus roofs. Executive Vice President John Affleck-Graves and Vice President for Research Bob Bernhard recognized Chip Farrell and Tony Cobb. 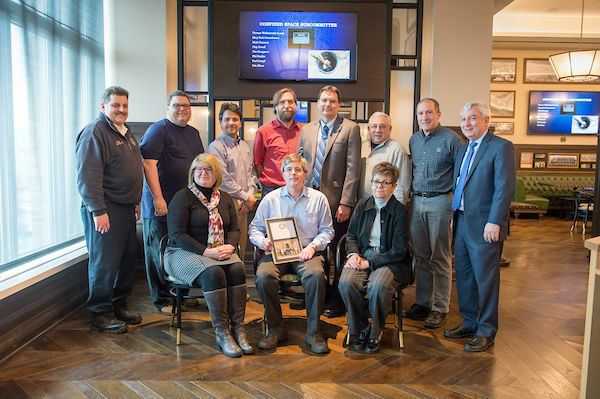 Tony Cobb, facilities program director in Notre Dame Research, was recognized for implementing new lab safety walkthroughs and other safety procedures in McCourtney Hall. According to Cobb, he and the McCourtney Hall Safety Committee, “address lab safety issues, which include, personal protective equipment, hazardous waste, housekeeping and chemical storage by making sure that labs are informed of any unsafe practices that may be found, and have the opportunity to take appropriate measures to get the items corrected.” The committee tracks and analyzes the data, fostering safe practices in this new space on campus. The work of several committees and subcommittees was also recognized at the event. The Hot Work Subcommittee, Fall Protection Subcommittee, and Institutional Biosafety Committee were specifically highlighted, in addition to the larger Lab Safety Advisory Committee and Operations Safety Advisory Committee. The Laboratory Safety Committee was honored for their work. The Lab Safety Advisory Committee has been led by Patrick Fay, professor of electrical engineering, since 2015 and is comprised of both faculty and staff members committed to improving safety in labs across campus. 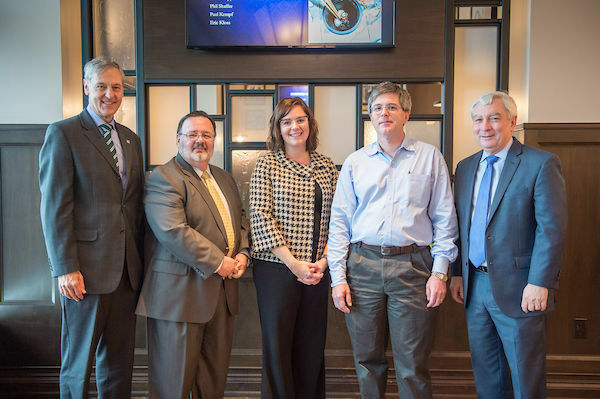 Those in attendance also honored the outgoing chairs of the Operations Safety Advisory Committee, Heather Christopherson, director of Maintenance, and Mike McCauslin, senior associate director of Risk Management. The committee promotes and ensures a safe environment for students, faculty, staff, and guests by creating and fostering an active interest in safety and environmental stewardship. As one of the largest collaborative safety committees, the Operations Safety Advisory Committee has been successful at engaging department leadership in the development and execution of reformed safety practices and protocols. 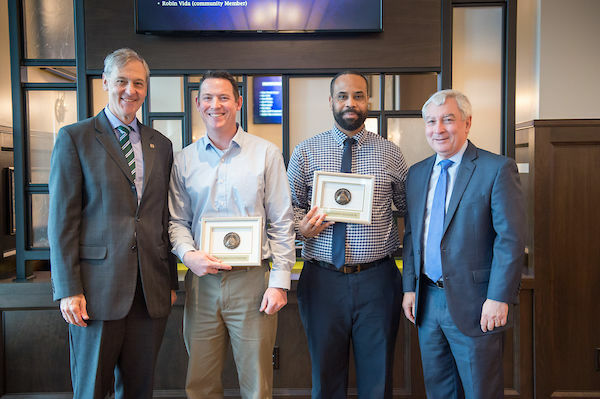 The Executive Vice President and Vice President for Research also recognized chairs Heather Christopherson, Mike McCauslin, and Patrick Fay. The Hot Work Subcommittee, led by Adam Kratt, seeks to improve safety surrounding any work that involves burning, welding, using fire or spark producing tools, or that produces a source of ignition. Promoting safety in these areas involves thorough training for university employees, creating effective procedures, and careful review of Hot Work Permits. The Fall Protection Subcommittee, led by Randy Crist, oversees the University’s effort to improve the guidelines and procedures that govern work done on roofs, scaffolding, trees, or other heights around campus. Fall Protection incorporates employee training, equipment inspection, hazard assessment, and solution development. Led by Mary Prorok in the Department of Chemistry and Biochemistry, the Institutional Biosafety Committee (IBC) reviews and approves laboratory protocols that involve the use of potentially biohazardous materials and agents. The committee reviews scores of protocols each year and works closely with researchers to ensure compliance with NIH guidelines for the handling of biohazards, maximizing biosafety for all concerned. The Institutional Biosafety Committee, chaired by Mary Prorok, was also recognized for their work. 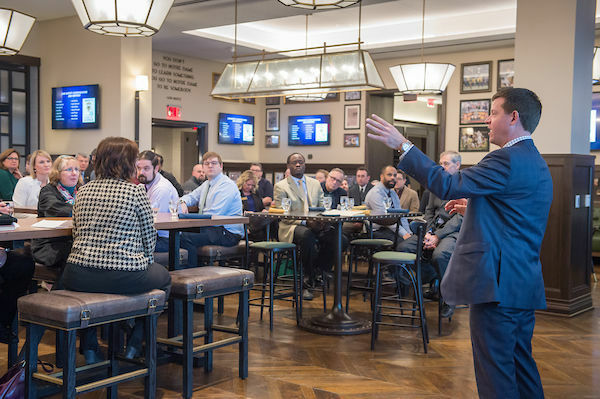 Those attending the Annual Safety Recognition Luncheon gave well-deserved attention to a number of individuals and committees whose dedication has helped to make Notre Dame’s campus a safer environment for all. The entire Notre Dame community appreciates their accomplishments. Originally published by Maggie Rogers and Marissa Gebhard at evp.nd.edu on February 25, 2018.